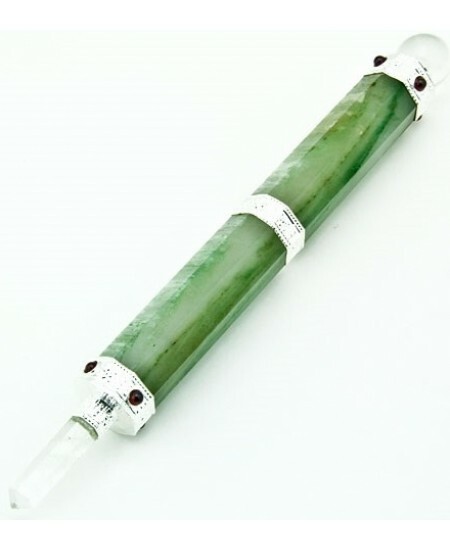 Green Jade with clear quartz and garnets combine in this lovely handmade wand set with silver perfect to heal and bring good luck. This lovely handmade green jade and clear quartz crystal wand vary between 6 to 8 inches in length with Indian silver mountings. 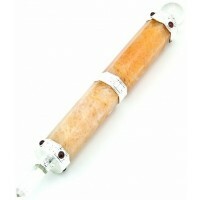 It is made in India with carved natural crystals with a crystal sphere at one end and a point in the other. The sphere is receptive to storing energy collected and directed thru the point. 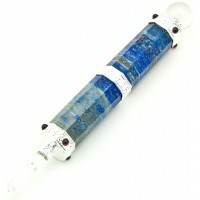 The shaft is Amethyst, point and sphere are clear quartz. Green Jade. 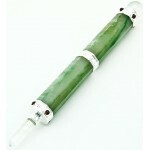 Said to bless everything it touches, Jade has been highly prized for thousands of years from Great Britain to China. 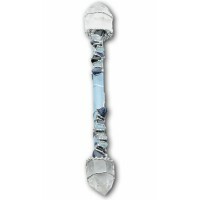 It is valued for its beauty and powers of healing and protection. Easy to carve, it has been used for offerings and amulets all over the world for good luck, friendship, wisdom, and dispelling negativity. 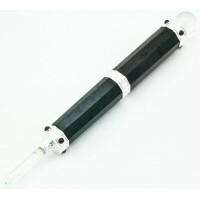 Item Number: OI-WAND09 | Approximate Size (Inches): 1.00 wide x 1.00 deep x 8.00 high | Approximate Shipping Weight: 0.50 lbs.